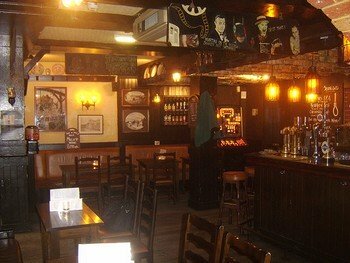 Country pubs, town pubs, city pubs, the “local” pub ...however you feel about Scottish Pubs, they are a social gathering place, a focal point of most towns and cities, and come in every size shape and description. 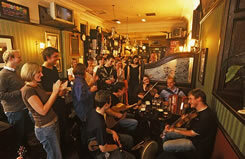 Here you will find, as well as a "pint", food, music and the company of the local Scottish people. The pubs are usually open between 11.00am and 11pm, and on Sunday from 12.30 to 10.00pm. This is what we call "a corner pub" - it's a pub on the corner! For those of you who are visiting from out of town, or have been away from Scotland for a while, since 2006 smoking has been banned in pubs...good news for non-smokers, not so good for smokers, but hard as we try, we can never please everyone! Like Scotland's people, castles and homes, the pubs each have their own distinct personalities, and the characters you meet there, you will never forget. Dropping into a nearby pub is a great way to meet the local people, have a drink and something to eat, at a time that suits you. It's up to you to find your own favourite local..there's plenty to choose from! 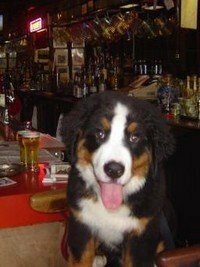 In some pubs you can bring your dog..and the "dog pubs" will be ready with a water bowl and a treat for them. 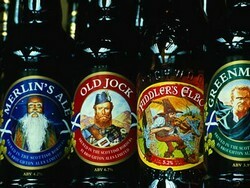 For a list of those you can go to http://www.dogpubs.co.uk/scotland.htm. The sheer number of public houses in Scotland, and the fact that you can find one just about anywhere, may lead you to believe the Scots are an alcoholic nation..this is simply not true. 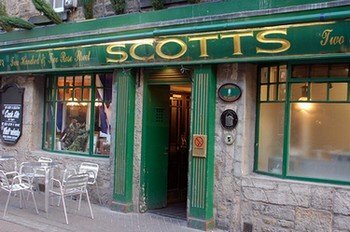 While some Scots do like to drink lagers and liqueurs as well as Scotland’s own beer and whisky, or whatever their drink of choice..they are also a very social people, and the pub is more often than not, a gathering place. Look for the sign, but not all pubs have one as easy to see as this..
You will feel the pub's own particular atmosphere and personality as soon as you step through the door. Some are quiet and reserved, some a little more lively.. a lot like someone's home really. Most everyone's welcome, and the company constantly changes. Everyone in Scotland it seems, has a "local", their favourite place to go. You can sit with a pint of beer forever, (or a cup of coffee), have lunch or even dinner. For some people, the pub is a home from home. It all depends what kind of company or entertainment you like best. Because the "public house" has been part of life, and a fixture forever in Scotland, you don't have to drink when you go there. If the pub serves food, children can go in with their parents, and often do, although to buy and consume alcohol, you have to be eighteen. Children under 14 years are allowed into pubs which hold a "children’s certificate", but they must be accompanied by an adult and are restricted to areas which have been deemed suitable for young children, usually a restaurant type area. (Pubs holding such a certificate must serve meals and non-alcoholic drinks, normally until 9.00pm. Again, good news for parents, since 2006 smoking has been banned in all pubs and bars). 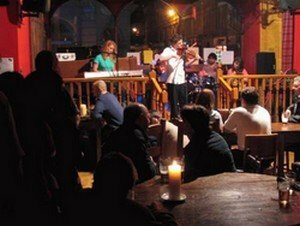 Music, food, company, or just peace and quiet to chat or read the newspaper, you can find it all in Scotland's pubs. You can have a wild night, or a business lunch. 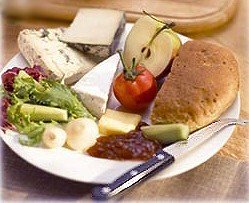 Pub lunches are great..you can have sandwiches, soup, fish and chips, or even the popular “ploughman’s lunch”, with nice bread, good cheese, and often served with pickles, a tasty compliment to the cheese.. Pies and beans, sausage and beans, and chips (french fries to some!) are also popular. 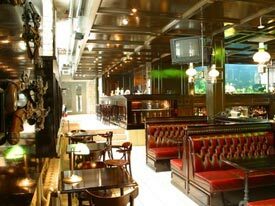 Edinburgh is particularly full of pubs and nightspots. 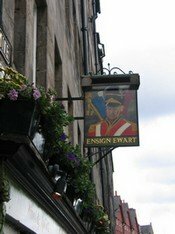 For a listing go to www.edinburgh.pubs.freeuk.com. 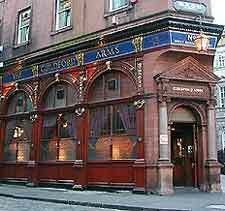 Jazz, folk, traditional Scottish music, pubs full of college students,(especially in cities like Edinburgh and Glasgow) pubs for lawyers, businessmen, and regular working folks, or all mixed together... you will find them all in Scotland, on nearly every town and city street. Now there are certain places you don’t want to go, especially if you're peace-loving and/or from out of town! You should probably steer clear of the pubs in some of the more depressed areas of the larger cities, as occasionally brawls have been known to break out. Then of course anywhere around a football match can get a little fraught...so avoid those too.. 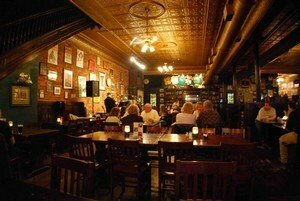 The "last bell" rings usually about 15 minutes before closing time, and in the early evening many pubs have a "Happy Hour" when you can drink for a reduced price. A useful tip - when travelling in the Highlands and Islands many pubs close between 2.30pm and 5.00pm, and may, in the wintertime, close completely, so it’s better not to count on one being open, say in the Outer Hebrides and round about the Islands.